Question: At work we have the standard 5 gallon purified water cooler. We heard spring water is better for you, as it provides more minerals and hydrates better than purified water. But the problem is, we cannot find a distributor that provides water coolers of spring water. So we have decided to look into bottled spring water and get rid of the water cooler all together. Another question, is there any benefit of drinking cold water vs. room temperature water? Our water cooler is cold, but we will not have the capacity to keep the bottled waters cold. Love the site - it is so helpful! Thank you! WBH answer: Great question! I haven't had a chance yet to address water coolers on my site, so thank you for the opportunity. I am assuming that the type of purified water that is currently being used with your water cooler is reverse osmosis water. If you haven't already done so, you might want to skim my article on reverse osmosis water, which explains why I generally don't recommend it over filtered water. So, yes, I agree that natural spring water is more conducive to health than purified water. Should you look into bottled spring water instead of using a water cooler? It really depends on your office set-up, how many people are involved, your health priorities, cost considerations, the importance in having quick and easy access to hot and cold water, and whether your company honors green initiatives. I rarely recommend bottled water for a number of reasons. I have covered these reasons on several pages of my site, including Bottled Drinking Water and Drinking Spring Water. I encourage you to read these articles so that you understand the key reasons. One key reason is that bottled water regulation is so poor that just because the label on the bottle says it is spring water does not necessarily mean that it is. Studies have shown that nearly 40 percent of bottled water is simply re-processed tap water. Bottlers can say just about whatever they want on the labels to appeal to buyers. However, in all fairness, I believe there are some bottlers who do bottle good quality spring water, but you have to be willing to call the company to find out where the source water is and how they treat the water. But to answer your question, I do think the bottled spring water (if it is in fact filtered spring water) is a healthier choice than the water cooler water if the cooler uses water that is purified using reverse osmosis or distillation. Option 1. 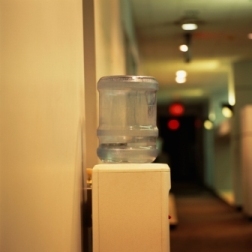 The best option for your office drinking water, as far as I am concerned, would be to install a countertop or under sink water filter system in the office building (if there is a sink where this is possible and accessible)--and if your management is in agreement. We have water filter reviews and recommendations for both countertop tap water filters and under sink water filters on this site. The reason I recommend this option is because these types of water filter systems remove the most contaminants from drinking water, while leaving the natural occurring minerals in the water. Option 2. Another option to consider might be a bottle-less water cooler that has a high quality water filter. To be honest, I have not fully researched all the options available for bottle-less water coolers. However, I do know that the Crystal Quest bottleless water coolers have high-quality filters (several stages of filtration). This company has many models to choose from but, again, I do not recommend the ones they make that use reverse osmosis. Sometimes people or companies will balk at a water filter system because the initial cost is more than bottled water, but if they would look at the cost of bottled water vs the cost of ANY water filter system over the period of a year or two, the savings is significant with a water filter. To answer your last question, room temperature water is generally better for the body (for any living thing) than cold water, especially anytime before, during, or after eating (meals or snacks). The cold water negatively affects digestion. However, there is one known benefit of drinking cold water between meals. Some experts have said that it can help people to lose weight (if they need to) because the cold water makes the body generate heat, burning more calories. But the weight loss is minimal. I have also discovered in my nutrition business that people who have an aversion to drinking water will usually drink more water if the water is cold. In fact, they may not drink water at all if it is room temperature. So that is an important factor because drinking enough water daily is critical for optimal health and hydration.